Created by Macquarie University School Resources - find large res. version here. 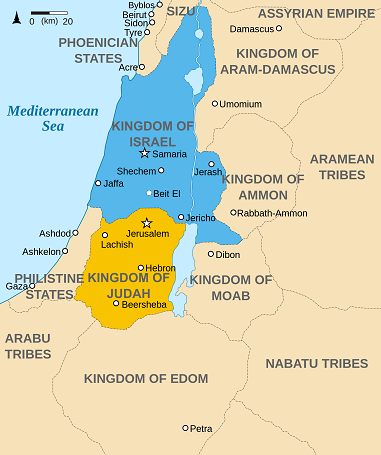 Kingdoms of Ancient Israel and Judah during the Iron Age, with significant sites highlighted. Aharoni, Y. (1979), The Land of the Bible: A Historical Geography (trans. and ed. by A.F. Rainey). pp.3-6: Introduction to the geographical setting and its role in relation to the Fertile Crescent. pp.11-13: Geological characteristics of the land and its agricultural potential. pp.22-24: Jezreel Valley and a map of Israel’s different regions. Hindmarsh, H. and C. Harnack (2009), The Near East: Nelson Ancient History. 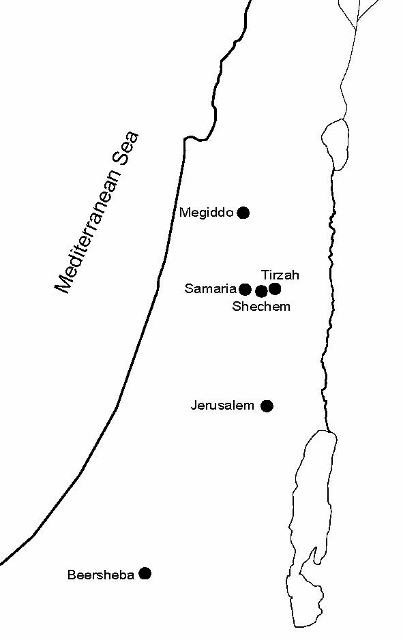 pp.130-133: General outline of the geographical setting of Ancient Israel. Rainey, A.F. and R.S. Notley (2014), The Sacred Bridge: Carta’s Atlas of the Biblical World 2nd ed. p.39: Very brief geographical description of Jezreel and Samaria, with emphasis on their mentions in the bible. pp.41-42: Climate, with emphasis on how the rainfall regime dictated the cultivation of the land throughout the year. Rogerson, J. (1985), The New Atlas of the Bible. pp.146-151: Geographical description of the heartland of the Kingdom of Israel (Bethel, Samaria, Carmel and Jezreel) with detailed topographical maps.